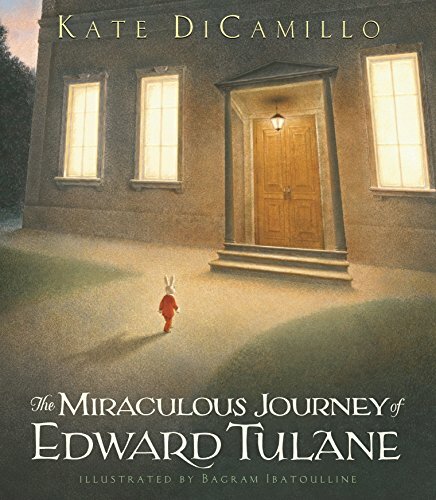 Care suggested The Miraculous Journey of Edward Tulane to me to help me out of my reading slump. I trust Care's taste implicitly, and certainly in these matters, so I immediately put in a request for the book at the library. The Miraculous Journey of Edward Tulane centers on a porcelain rabbit named Edward. Edward thinks quite highly of himself, living a coddled life with a wealthy family. But he doesn't think very highly of anyone else. One day, though, he is lost, and over the next several years, Edward goes from person to person, learning the importance of friendship and love and loyalty. Kate DiCamillo tells Edward's story in very simple language. It's an easy read in that it doesn't take long to finish at all. However, make sure you have some tissues handy because I was sniffling through much of the story. I realize this is a children's story, but the part that really stood out to me was Edward's complete lack of agency in his own life. It was so sad (especially later in the story, when Edward became a much nicer rabbit) to watch him just take what life threw at him, and try to make the best of it. I had a version of Edward when I was a child. I say "had," but my stuffed bear Chocolate is still with me. And sometimes, when times are rough or I feel pretty lonely, I bring him out to bed with me and have a good sob session. Chocolate has been with me through a lot. There's something so comforting about sharing secrets and moments of weakness with someone who will never think worse of you. And that's what was so beautiful about this book. Edward was not only a friend to children but he was also a friend to lonely wanderers, mourning parents, dogs and other dolls. All of us, many times in life, and all through life, just need a sympathetic ear and shoulder to cry on. I love that about this story. I will have to see if my library has this one. It sounds like such a beautiful story. I still have my "Doggie" who was my comfort growing up. He's preserved in a plastic bag in my trunk now, full of holes and in need of a makeover--a simple mending won't do anymore. I just can't bring myself to throw him away. We've been through so much over the years--well into my college years, really. This book is so good. I listened to the audiobook, which was amazing. Highly recommend. Oh, and I still have my Edward, too. This is partially why the ending of Toy Story 3 upsets me so much. PS: I still have mine Edward - he is a polar bear named Fuzzy Snuggles. I'll get hanging out in the Retirement home with him!